The news about iPhone 7 spread over the internet in a matter of minutes. Scores of reviewers immediately jumped on the wagon and started talking about this new device that, as usually, brings a couple of innovations to the table. The creativity of Apple engineers had a weird loop this time and we are talking about the headphone jack. While this interface contradicts the idea of a device being waterproof, we are certain that a solution for this could be found fairly easily. Let’s talk about this design decision. Is it really that groundbreaking? We remember that a couple of decades ago Steve Jobs actually released his version of the home PC and that version lacked some interface options that other PCs had. This made Macintosh a very interesting device and created a whole new subindustry. The decision to heavily limit customization options led to unrelenting criticism of MAC, but it turned out fine. Will the same happen with iPhones? Remember that Apple’s handheld devices are already somewhat isolated from other devices. Many iPhone users complained about not being able to use specific features at some points of time or had difficulties accessing media they enjoyed. The downsides were quite visible. However, Apple’s design team has always been on point and created highly attractive and high quality devices that people wanted to have. Each of the iPhone releases was a big explosion. People would start pre-ordering devices way before they would actually hit the market. Users would go crazy about new features and start talking about the devices on social media networks creating even more hype. The same is happening right now. Facebook, Twitter, and Instagram are buzzing about the iPhone 7 and its features. However, this time, the feedback doesn’t sound that great. Many users are concerned with the removal of popular interface slot and criticize this decision. Apple engineers surely know how to architect products that are nearly flawless from the technical point of view. Their design decisions may be questionable here and there, but the general consensus of the audience is that Apple knows its job. When the news about AirPods was released, some people were genuinely surprised by this decision made by Apple. AirPods are wireless headphones. When we say wireless, we mean it. The headphones are completely separated and there is no wire connecting either phone to headphones or simply headphones to each other. The product is a couple of separate headphones equipped with a plethora of interesting features like motion accelerometer and sensor detectors. The latter allows headphones to recognize when they are plugged into your ears. The slogan of the product says “Wireless. Effortless. 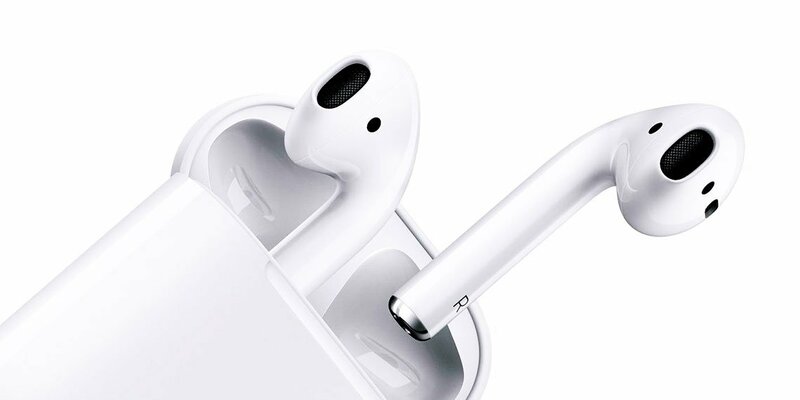 Magical.” However, if you search AirPods on Google, chances are you will find an image that adds a new tagline to the slogan that reads “And Lost. *The F-word*. Immediately”. Yes, two separate wireless headphones can be easily lost and it is a big concern for users. On the bright side, wireless headphones employ a brand new technology developed after Bluetooth Low Energy concept. 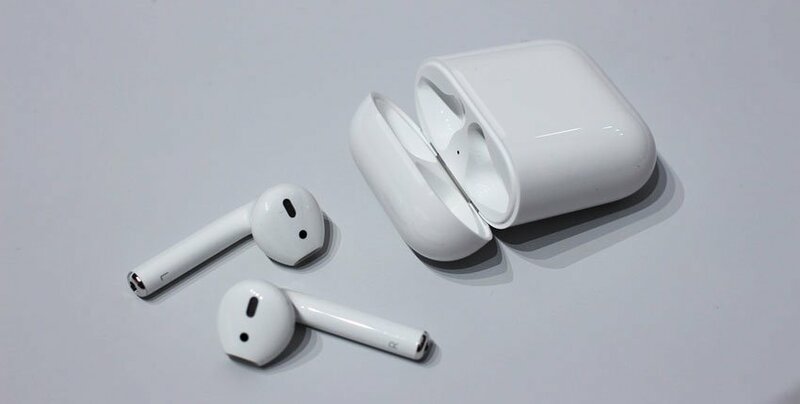 This new technology conducts connections between various Apple devices and links AirPods to iPhone or Apple Watch. The headphones themselves have small batteries capable of powering them for 5 hours. The accessory comes with an additional battery case that prolongs the battery life up to 24 hours of usage. The accessory seems to be a very interesting fresh solution for those users who enjoy hi-tech. However, more conservative users will be left without an alternative with the headphone jack being gone. The reasoning behind refusing to use AirPods ranging from “I simply don’t like them” to “it’s too expensive”. The spread of opinions is wildly broad. We can totally relate to the latter opinion. The price of AirPods and “airy” high. With the pricetag of $159, AirPods will compete with the most expensive Bluetooth accessories. At the same time, some users that are afraid to lose them in an instant should be really concerned with such a high price. The chance that one of headphones will simply fall out of your ear when you walk through a crowded place is quite high. For those who like listening to music AirPods is not the best solution. Apple also introduced their new headset and it will be available later. Possibly, in 2017. Curiously enough, Apple engineers believe that their design decisions are more than convenient and people won’t be losing their headphones left and right. Maybe, they were referring to their new headset? The amount of criticism this announcement received from the get go is immense. The vast majority of users immediately started mocking this decision going as far as saying that iPhone may become absolutely unusable without a headphone jack. Obviously, we do not believe that this will be the case. iPhone is a great device on its own with a lot of new improvements and features that will need an additional article to cover. Technical prowess of this device is outshined by the downside of not having an interface option for independent headphones manufactured by other brands. Bluetooth is still a thing and some devices may be usable with iPhone 7, but the majority of smartphone users still prefer using wired accessories when it comes to listening to music on their handheld devices. Some people listen to music even when charging the phone. Some internet wits started joking about how iPhone 7 gives them a new way of multitasking giving as an example the case when you want to listen to music while your device is charging. While this is obviously a joke, the concept of completely wireless headphones sounds fairly attractive and convenient. Another point of criticism to be noticed is that Apple engineers seem to be searching for overpriced solutions to nearly non-existent problems. For example, people never wanted to have wireless separated headphones. Those who like hands-free options go for traditional Bluetooth accessories that often come as a unit for one ear anyways. Those who would like to listen to music prefer Bluetooth audio headsets. Again, these are not separated things. The solution to a non-existent problem creates a new issue. Buying AirPods is like purchasing three devices in one: your left headphone, your right headphone, and a mandatory battery case. Let’s face it, many of us have troubles managing even one separate accessory let alone two. This is a problem that cannot be ignored. While using AirPods may be enjoyable and easy, taking care of them is a more complicated matter that may actually burden a user. Is the criticism justified? Yes, and no. While some fans go as far as creating a parody website that advertises appleplugs, others try to find positives in all this mess created by Apple marketing campaign. There are some advantages of having no headphone jack. iPhone 7 developers claim this device to be totally waterproof. No amount of water and water pressure can make this device drown and malfunction. Even some divers who do not reach the bottom of the ocean can take their favorite smartphones with them to the deeps of seas. Browsing your Facebook page from under the water surface may be a bit uncomfortable, but Instagram feed will be filled with selfies with oceanic backgrounds. This is also a joke. However, the device is resistant to water and having no headphone jack helps big time. There are simply less holes to be worried about. The problem is that waterproof is another seemingly unnecessary solution. We do not think that crowds of users were using their smartphones during heavy rains or under water anyways. The amount of users that will find waterproof actually useful is fairly small. Yes, it is a good marketing move to add yet another level of reliability to your device, but honestly, that’s it. You do not get anything truly useful. Your phone will still be vulnerable to physical damage, it is not just as vulnerable to cyber threats as any other device, and try remember how many times you actually wished that your iPhone 6 was waterproof. Nonetheless, the device is equipped with an advanced processor that will make it much faster and way more efficient at handling specific tasks. The brand new A10 Fusion processor is 40% faster than its predecessor and their new graphic processor is 50% faster than the A9. These upgrades are actually quite useful to anyone. You can enjoy only browsing your social media or be a technical geek who makes movies on your smartphone, in both cases chances are that you will enjoy the boost of performance that iPhone 7 gives you. iPhone is also equipped with dual cameras. Both cameras can capture high quality video and make the device way more versatile that anticipated. It is a good solution for vloggers and creative minds, it also caters to the audience of users who like to post selfies in their Instagram, Snapchat, and Facebook. While this sounds a bit silly to an intellectual minority of tech geeks, this is a big attraction for casual users who make the vast majority of Apple customers. Yes, there are advantages to be found in iPhone 7. However, the release still left more questions than answers and made many specialists scratch their heads perplexed with the ambiguity of Apple’s design philosophy. 6 Things About iPhone Release That You Should Know!